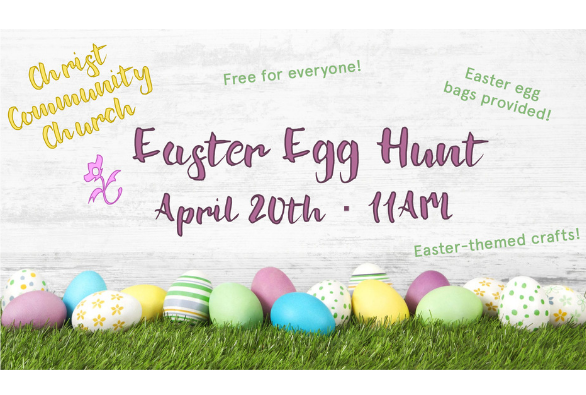 Join us for a free Easter Egg Hunt on April 23rd at Christ Community Church! Registration for the event begins at 4:00PM on site and the hunts begin starting at 4:30PM! We will have several different egg hunts split up by age group. In addition to the egg hunt, we will also have arts and crafts and a short Easter program with singing! Feel free to bring your littlest ones, because we will have a play area for 0-18 months old! Complimentary Easter egg bags will be provided at registration (while supplies last).